Wendy welcoming all the guests. 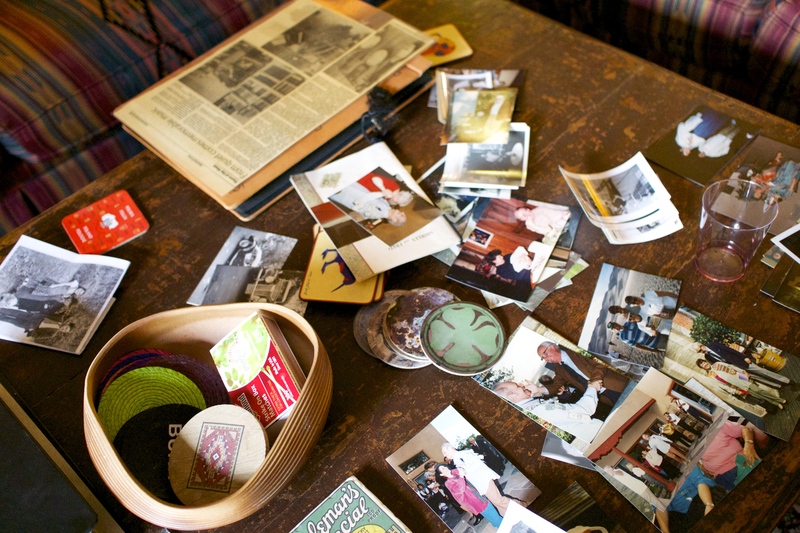 We gathered old photos of them for everyone to peruse, setting them out on Wendy’s coffee table. Well, I guess I am back to writing – true confessions, I just got too wrapped up in other things for awhile. But people seem to have missed my posts, as rare as they have been, so I have been convinced that I should sit back down at the computer and try to be little more prolific. I mean, let’s try to not have months and months go by without saying anything at all, I told myself. Even Arnold, who is the soul of discretion when it comes to urging me to do anything — I am eternally grateful that he never has hassled me about my weight, for example, no matter how much I was tormenting myself about it over the years – implied every so subtly, in about five well-chosen words, that he thought I might be well served (somehow) to get back to my blog. Actually, a few significant things have happened – we did go up to Los Angeles for ten days, and scattered my parents’ ashes (Ava’s were scattered on Lake Chapala) back in April. 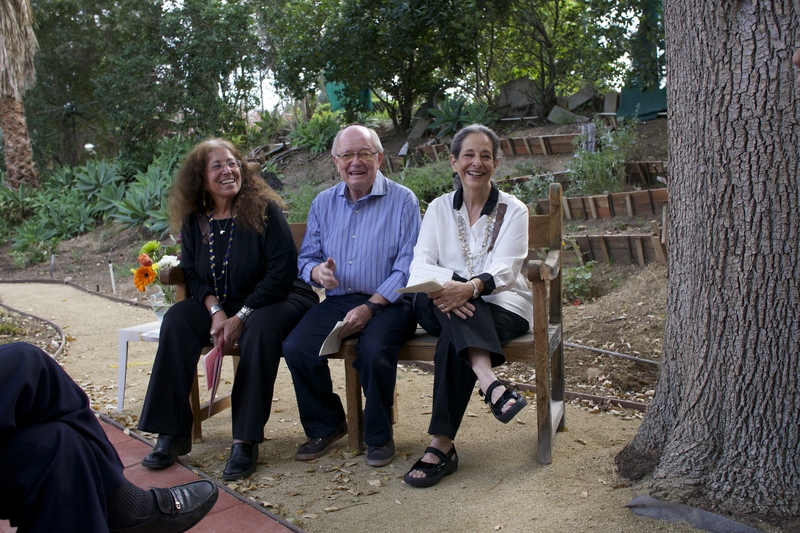 We had a memorial service for both of them in under the big trees in Wendy’s back yard and we were surprised that well over thirty people remembered them enough to want to attend, even after a couple of years since their respective departures. 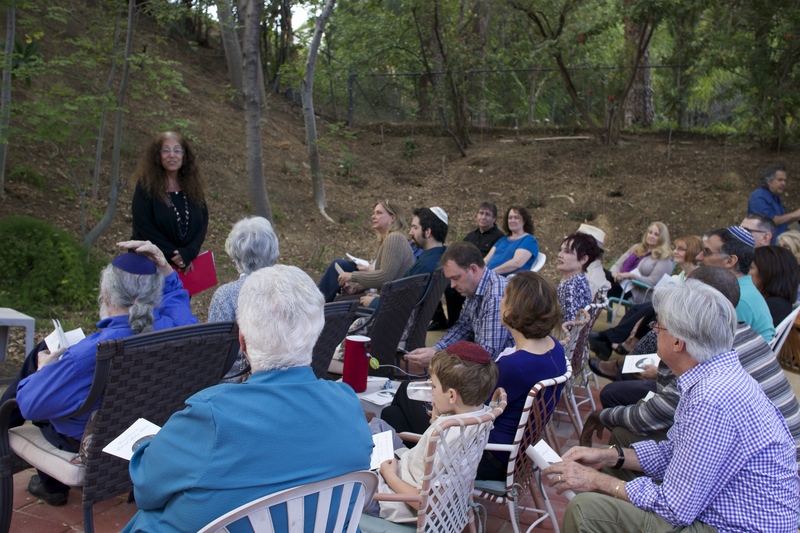 Wendy found a very nice, very Reform, rabbi to officiate so we actually sent them off – even if a bit late – with Kaddish and the 23rd Psalm and a few other ceremonial niceties in a quite lovely afternoon gathering, followed by an enormous feast procured from what everyone told us was the best Jewish deli in the San Fernando Valley. We figured the “nosh” part they would have loved, especially my dad. We ordered a platter of whitefish in his honor. Arnold made up a collection of music they both loved to be played – some Mahler, some Joshua Bell, and of course a pastiche of some of Dad’s music. But the rest of it — they were both so anti-religion, both so totally secular all their lives, that up till the end we had some misgivings about whether this was what they would have actually “wanted”. But Wendy wanted it and some of our older relatives found it very moving and appropriate. And Wendy still insists that our dad once confided to her that he wished he had had a bar mitzvah and certainly as he grew older – well, both of them, really – more Yiddish crept into their speech. Ultimately, being Jewish was certainly a big part of who they were, no matter how you slice it. We had gone back and forth – for a couple of years, really – about where to scatter their ashes – here, in Lake Chapala or somewhere nearby? back in L.A.? Venice? We had always joked with Mother about scattering her ashes in the Beverly Hills Saks. But at the end of the day we decided that Mexico wasn’t right, a memorial park (even a nice Jewish one in the Valley somewhere) wasn’t right, the ocean or a forest somewhere wasn’t right either. Actually, other than gathering for cocktail-hour drinks around their pool in Encino they were the least outdoors-y people you would ever meet. Thus, for a long time, and maybe that was just adjusting to the finality of the whole thing, nothing seemed quite right, so they stayed in my bedroom closet in their nice Mexican urns on a high shelf for a couple of years while life went on and unconsciously, I suppose, we sorted it out in our minds. For Mom, hanging out in my closet with all my (and some of her) clothes and Ferragamo shoes seemed perfectly comfortable, at least for the time being. Dad probably would have wanted to be near her (though inevitably they would have hissed at each other and fought) so that part seemed all right as well, at least for the time being. But we all felt we had to do something more with their ashes, and WHAT to do with them was always in the back of our minds. As horrible as it was, the thought of US dying with them still stashed in my closet was not something we wanted to contemplate. So we mulled it all over and invariably talked about it when the three of us were together, around their – now our – dining room table here at our house in Mexico. At the end of this process we felt that Encino was, in a weird way, where they had perhaps been happiest – young and glamorous, with the replaced-every-few-years red Jaguars and the restored-every-few-years MG in the carport, and family outings to various restaurants and concerts at the L.A. Opera or the Philharmonic. So the Encino hills felt right and Wendy discovered that since much of the mountain range behind their old house has since been made into a state park, that you could actually drive up into the park and look out over the San Fernando Valley and have their old house pretty much directly below you. The trees had long grown up too tall to see the house itself, but we knew exactly where it was from various landmarks – the water tank on top of the hill at the end of the road, where we had often taken walks, their street itself, the neighboring houses and empty lots where both of us had hiked and wandered around as kids. A few days before the memorial service we went over to the deli and asked to speak with the catering manager to put in our order. Of course he wasn’t in any way Jewish – he was a Mexican from Jalisco and before we even got down to talking about the food for the event we spent a half hour chattering away with him both in English and Spanish about Mexico and his life as an immigrant in Los Angeles, and how he had started as a dishwasher in the deli but now had worked his way up to being the catering manager. He knew more about Jewish food in his pinkie than I ever will. He so enjoyed meeting us that he sent us back to Wendy’s with (gratis) bags of rugulach and hamentaschen, apart from our catering order. We knew we were probably ordering way too much food but we figured we’d share it with everyone in doggie bags – they even gave us a stack of takeaway containers because “this always happens” – and in the spirit of Mom and Dad, we sort of didn’t care, we just wanted it to be a great spread reminiscent of their own great parties. One thing we knew for sure was that they both would have approved of a fiesta. Early the morning of the memorial service Arnold, Wendy and I drove up to the park with a discreet bag containing both sets of ashes and we hiked up the main trail. Other people had similar-looking bags, so we figured we were weren’t the only ones with this idea. It was very nice up there, actually, and since it was a Sunday, there were all sorts of folks walking around up there, riding bikes, hiking up or down the more difficult trails. Wendy carefully opened the bags and scattered their ashes – some together, some apart – on a promontory right where they would be overlooking their old, much loved, home on Gable Drive – with the valley spread out below them. It was a slightly foggy morning – but we knew there would be those clear days when you can see every detail even of the mountains ten miles across the Valley where Wendy lives now – and at night, of course, it is a carpet of glittering lights – très Hollywood – and on smog-free evenings, we used to enjoy that view all the time from our living room windows when we lived up there. We all felt better that evening, after the last guest had gone. I guess there had indeed been some “closure”, and for Arnold and me, who never get deli food down here, the reception after the memorial service was a highlight. It was good to see so many friends and family members there. We tried hard to do whatever would have been appropriate and “what they would have wanted” but as we all know now, with 20-20 hindsight, they were increasingly incapable of dealing with even the most important details of their future lives as they aged. Having any kind of conversation about them about their inevitable ends proved to be impossible (though every once in a while, in financial planner mode, I would take a doomed stab at it), so we ultimately just had to wing it. We did the best we could. Que En Paz Descansan.